SouledOut.org is the online media expression of Safe Space, founded in California in 1982 as a nonprofit organization. Our online mission is to bring the experience of Divinity to everyday life in order to Cultivate, Educate and Inspire All towards Universal Truths. You're invited to participate .. Here are ways to Support Our Work!  Share SouledOut.org web pages with friends. • Subscribe to our email list for monthly reminders about our full moon meditation focus. For the 2016 - 2017 spiritual year, our monthly meditation seed focus is Cosmic Freedom Inaugurates Planetary Liberation.  Weekly Spiritual Focus ~ Participate daily in the manifestion of Humanity’s Divine Destiny in a unified spiritual focus guided and inspired by our monthly meditation seed focus. 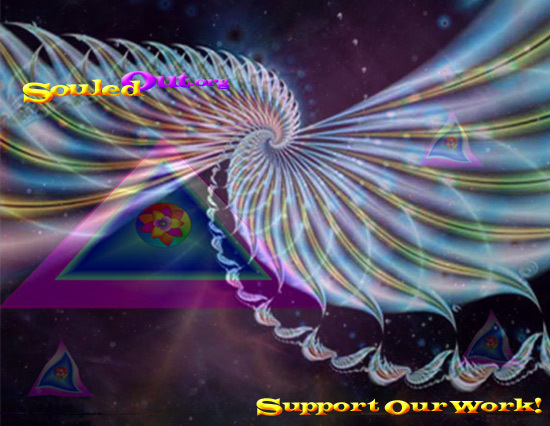  Participate in Spiritual Festivals ~ Send us information on any new Global Meditations.  Meditate on the Principles and Laws of the Kingdom of Souls with SouledOut.org.  Share meditation impressions and let us know your experiences while visiting SouledOut.org @ WeCycleWisdom, SouledOut.org's Living Wise Blog.  Contribute financially ~ This enables us to continue our online ministry and our service in the world. As Safe Space is a 501(c) (3) nonprofit organization, these donations are tax deductible as allowed by law.  AmazonSmile ~ In support of SouledOut and our Computer Upgrade Fund, you're invited to designate Safe Space in San Francisco to receive .5% of each Amazon purchase made. Then whenever you make a purchase, just be sure you're logged on the Amazon Smile page "smile.amazon.com" (not the "regular" Amazon page link) to shop.  Enjoy the Experiment, the Experience and the Expression of SouledOut.org!